Within the space of a single bed, bunk beds create a sleeping space for almost two to three people comfortably. And this is the very reason why dormitories and hostels mostly offer bunk beds in order to make maximum use of limited space. And at homes, most of the kid’s rooms have bunk beds. One reason is kids simply love the design, going up the ladder to reach their beds is fun for them. In any case, be it for adults, guests or kids, maximum usage of limited sleeping space is perhaps the idea behind installing a bunk bed at home. This is a twin over twin convertible bunk bed from Coaster Home with the lower section that can be converted as a seating table as well. The lower section design is in fact incredible. With a table in place, the seating space is highly comfortable and can easily accommodate 4 persons. This section can again be converted to twin sleeping space. 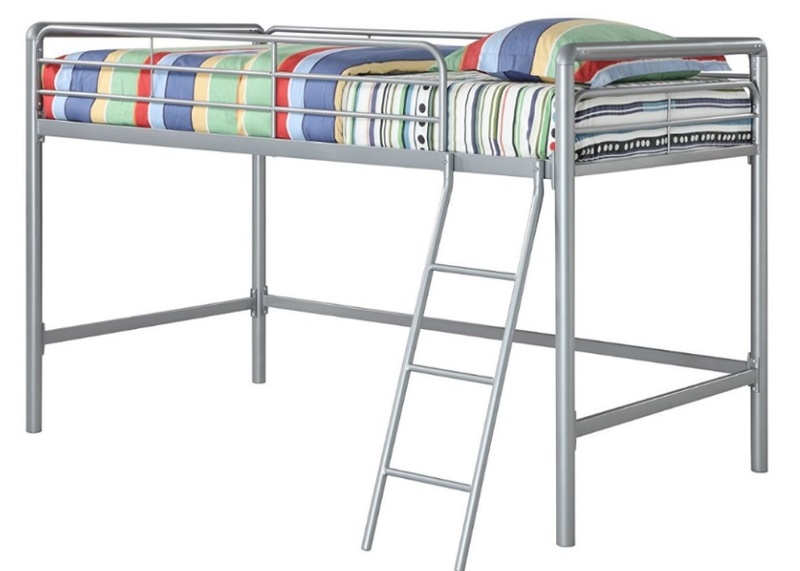 It is again a twin size sleeping surface and comes with safety railing on all four sides. The central ladder to reach the top section is sturdy enough and doesn't create creaky sounds as you go up and down. Both the top and lower sections of Coaster bunk bed can sustain weights up to 400 lbs each which means that even teens can sleep happily. Coaster Home bunk bed Assembly: The bed comes unassembled with all the pieces wrapped up in foam. You might just a need a wrench, a Phillips screw driver and an hour or so of your time to put everything together. The assembly is pretty simple and the instructions are all there in the assembly manual. To fasten up the process, it’s better to have an assembly partner. 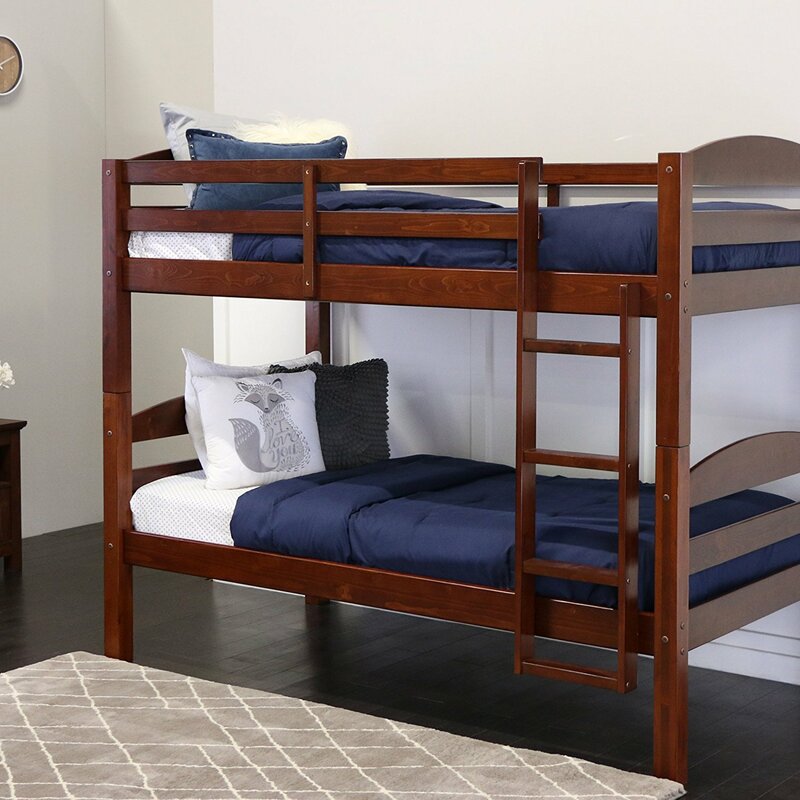 This exquisite bunk bed from Walker Edison is also known as an all-rounder as you can not only use it as a bunk bed but also as two separate twin beds as and when needed. 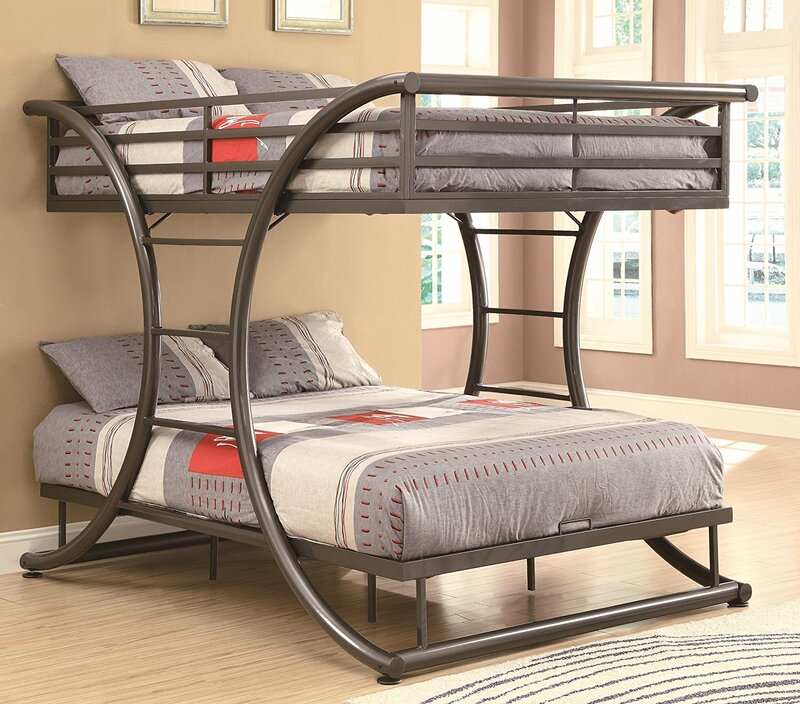 You can use it as a bunk bed if you are short of space, else you can rather convert it two individual beds in case you have that sufficient space available in your kids room. Material: Made from solid pine wood it is as hard as a metal bed but much lighter. It weighs mere 112 pounds and two people can easily set-up it up as bunk bed or separate them as two individual beds. Made from wood, Walker Edison has made this bed available in as many as seven different colors. Safety Rails: The upper deck has safety guardrails on all 4 sides thus removing the fear of kids rolling over. Ladder: The ladder is again something really special as you can set it up in either of the sides. Most bunk beds have the option of setting it up only on one side but in this Walker Edison’s bunk bed, you get the choice of fitting in the most suitable side based on the direction of your kid’s bedroom wall. 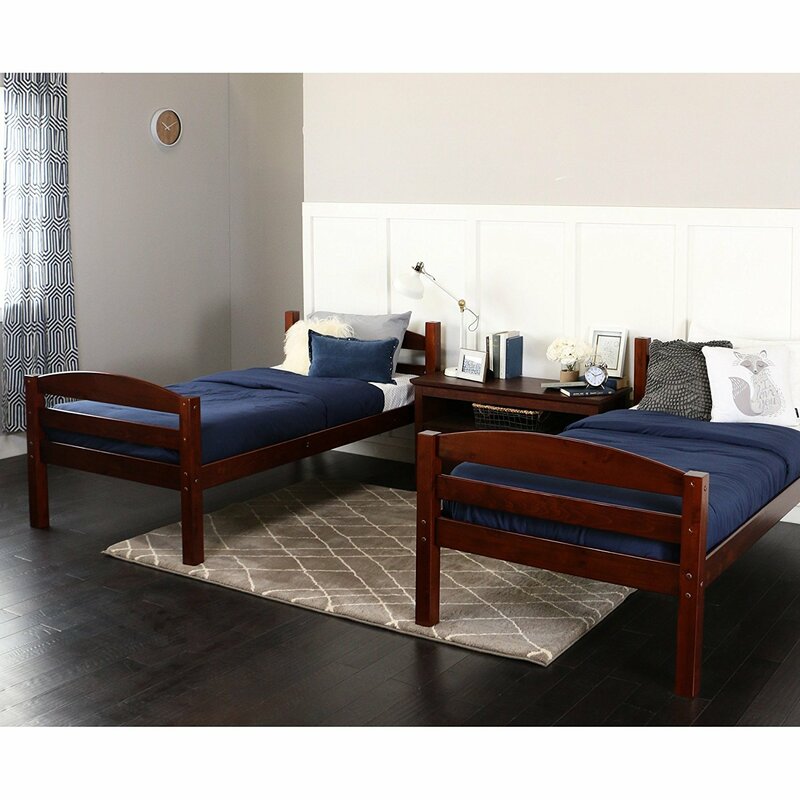 This twin over twin bed from Mission, although is on the costlier side, offers some of the most exquisite features. 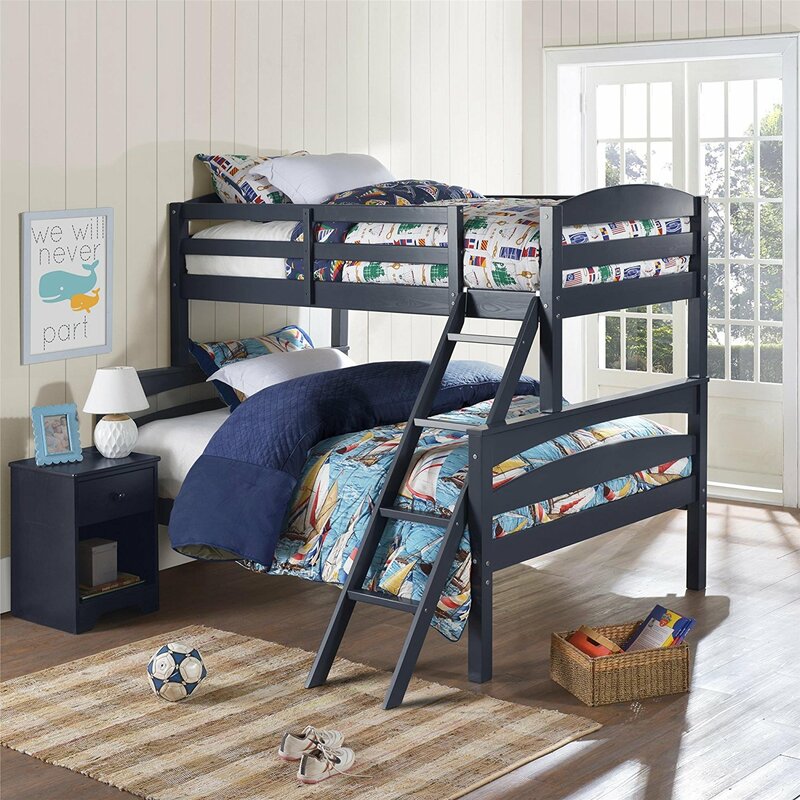 With rich honey lacquer finish, this bunk bed from Mission gives that splendid look to your kids bedroom. And the storage is something that you can stuff all your kid’s belongings in just this one bed. Made from solid wood, there are a total of 7 drawers in addition to magazine racks thus providing maximum storage space that no other bunk bed in the market has got to offer. All these 7 drawers have European metal drawer glides making the opening/closing of drawers easy and noise free. 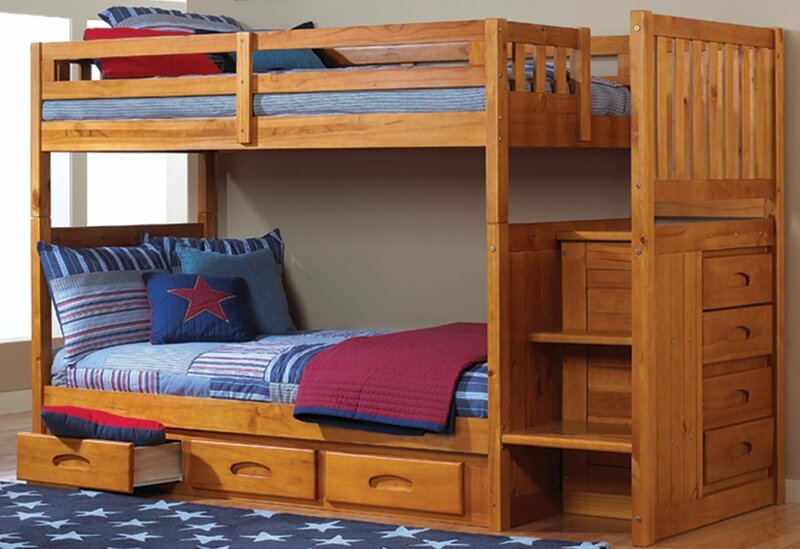 Another big advantage with Mission bunk bed is the adjustability of the staircase. Yes, you can place the staircase on either side of the bunk bed. The top deck has full guard rails on all four sides thus providing maximum security. Mission bunk bed meets all CPSC and ASTM specifications. This is another reason to justify the price. Most other bunk beds at low cost might not meet these much required industry specifications for child and toy safety standards. 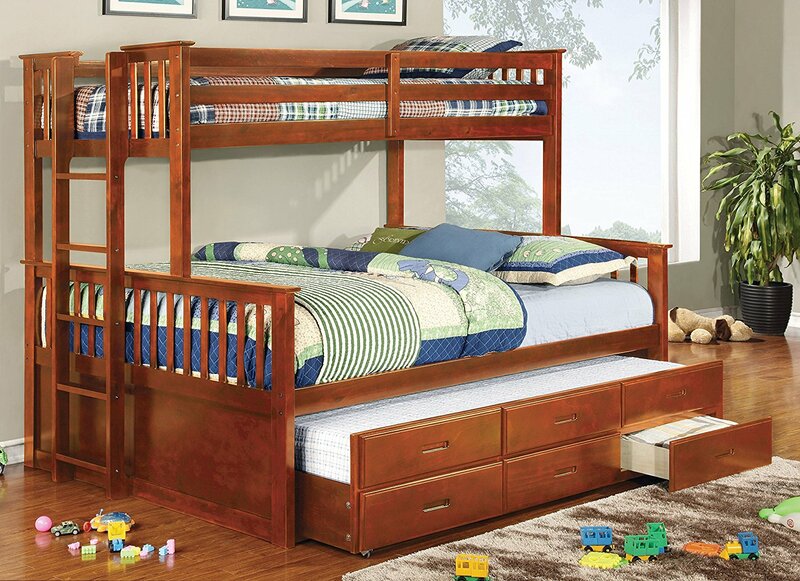 All the above beds that we have reviewed were either twin-over-twin or full-over-full bunk beds but this bunk bed from America Pammy is a twin-over-queen bunk bed with the central ladder embedded at the foot section of the bed. This bed in fact saves a lot of space for you at home as it suitable for both adults as well as kids. While your kid enjoys sleeping on the top deck, you can sleep on the lower deck. Or when your kid grows old enough, he/she can switch to the lower deck while using the upper deck for storage. The space beneath the lower deck is designed to accommodate a 3 desk trundle plus another queen size sleeping surface as shown in the image here. However, this trundle is sold separately. This is yet again a good option as we may or may not need the trundle if we have other available sleeping and storage provisions at home. In case you don’t then perhaps it would be good to go with the 3 desk trundle plus additional sleeping are at some extra cost. In case you don’t go with the trundle then you will be left with plenty of under the open storage area as the lower deck stands at good height above the ground level. The ladder to reach the top deck is located at the foot level and the steps are rectangular in shape offering maximum grip while going up the ladder. The top deck of the bunk bed is fully secure with guard rails on all four sides. Apart from being a twin-over-full bunk bed, the manufacturer Dorel Living provides the design flexibility where in you can use the two beds as stand alone as well. Being a twin over full, the lower deck can also be used by adults while the upper deck is reserved for children. It can perhaps save a lot of space at home. There is an additional 13 inch space between the lower deck and the floor which again can be used for storage. It is always advised to have a 6 inch mattress on the top deck while you can either go for an 8 inch or 10 inch mattress on the full size lower deck. Another best feature of this bunk bed is the detachable ladder. Yes, the ladder hooks to the top deck at the foot level. And having a removable ladder means bedding the upper deck is a much easier process. The upper deck has guard rails on all four sides and a 6 inch mattress on it would even with the middle rail, thus preventing your little ones from rolling over while asleep. Made from solid wood, Brady bunk bed is available in 5 different to choose from. This is a full over full bunk bed from Coaster Home Furnishing that can accommodate as many as two kids on the lower deck and one kid on top deck to sleep comfortably. The lower section without side rails can perfectly fit in even adults apart from children. The top section, which has metallic rails running on all four sides, provides maximum security preventing your kid from falling down. The ladder to reach the top section is embedded within the semi-circular design which is unique and looks quite attractive in gunmetal color. You can either have one full size bed or two twin size beds on each deck and each deck comfortably sustains weights up to 300 pounds. On the whole, the bed I believe can also be used by adults as it has a very open design and is quite spacious. You can reach the top deck from both the sides as the curvy metallic design has ladder steps fitted on both the sides. An 8 inch mattress, either two twins or one full, shall perfectly fit on both the decks. Personally, I believe that a 12 inch mattress would help better on the bottom deck as most often even adults might use it. Coaster Home bunk bed Assembly: There is an instruction manual along with the package and it should take well around couple of hours for one person to put everything together. An Allen wrench needed to fix all bolts is also included as part of the package. The frame is very sturdy and does not really make any creaky sounds as you go up and down the stairs. The ladder steps are flat and not rounded thus offering the right grip without the scope for slipping while bare footed. 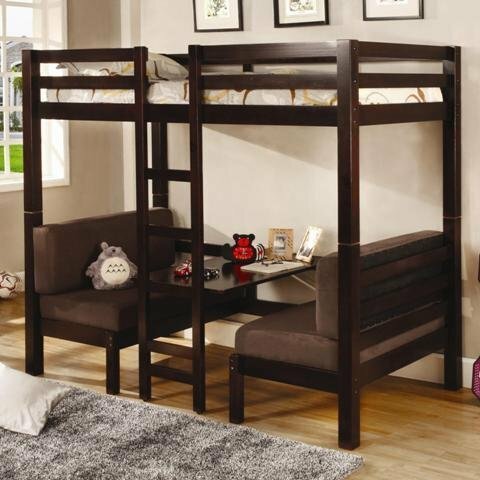 This loft bunk bed from DHP is mainly designed as a space saver with a twin size bed on the upper deck. The lower deck area is intentionally excluded so that it can be effectively used as kid’s study, play or for storage. The space is sufficient to place another twin/full size mattress or an air mattress at nights where even adults can use it as a sleeping option. The ladder is slightly slanted and is relatively pretty easy to reach the top deck as it’s a low height bunk bed. The ladder can only be fitted to the right side of the bed so make sure to select right direction/wall in your room while assembling the bed together. Made from metal, it comes in five different colors and can comfortably support weights up to 200 lbs, which means that your kid can use it for a really long time. The top deck has full length safety rails running on all four sides that ensure maximum security to your kid while asleep. But make sure that you either have a 6 inch or an 8 inch mattress on the top deck. Anything above 8 inch might fully cover the entire safety railing height. You can make effective use of the lower area as your additional sleeping area as well. A twin size bed perfectly fits in the beneath area or place a full size mattress perpendicular to the wall and adjacent to the ladder. In addition to a full size upper deck, this loft bunk bed from DHP comes with a working desk and two ladders. A 15 inch wide and 55 inch length working table is fitted in the middle section. Connecting the two right corners, there are two shelves which can be used to place your books or fancy items. And when you are done with the work, you can convert the beneath area as sleeping surface by placing either a full size or twin size mattress on the floor. Instead of having just one ladder, the design embeds two ladders, one of the sides and another on the front. Personally, I believe this is a perfect design as you need not really worry about placing your bed against any wall in your room as it has two directions to get to the top deck. The metal frame is of high quality and can comfortably sustain weights up to 300 lbs, lasts longer till your kid grows old enough. 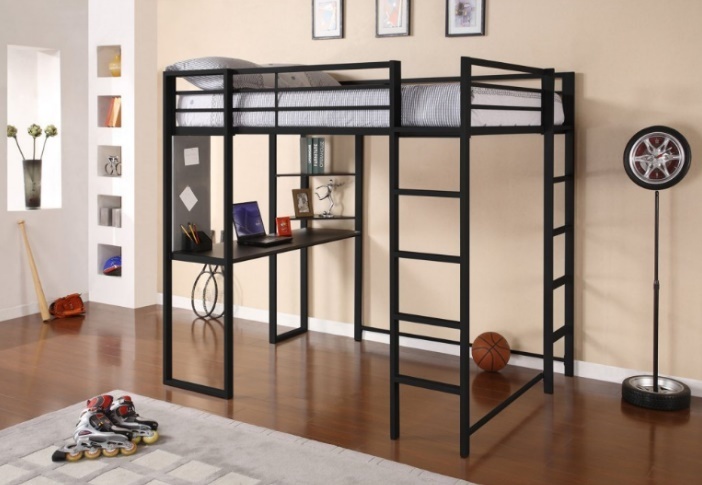 This bunk bed is available in two different colors, black and silver. The top deck has safety guard rails on all four sides providing maximum security to your little ones. An upper deck with full size sleeping area followed by working table, two shelves and area beneath offering additional full size sleeping surface, perhaps, this bunk bed is surely a steal at the quoted price. Yes, renowned bed frames and mattress manufacturing brand Zinus, has its print even in bunk beds category. This bed from Zinus is a twin over twin with dual ladders. And it’s biggest USP is the assembly process. The whole bed can be quickly assembled well within an hour which is relatively much lesser when compared to all other bunk beds in the market. The steel frame is of high quality and both the upper deck and lower deck individually sustain weights up to 175 lbs. Be assured that the bed frame will surely last for long time. Zinus has so much confidence in its own product that it has readily offered a 5-year worry free warranty that, perhaps, no other brand in the market offers such long-term warranty. The top deck offers maximum security as it has full length rails on all four sides. The two ladders to reach the top deck are on front and back of the bed. So, in whatever position you place the bed, you would always have one ladder available. On the whole, the bed is simple in design with durable steel frame, 5-year warranty period, dual ladders for any side access and above all comes at a relatively reasonable price. The price is neither too high nor too low for the features it has to offer. Zinus, is a proven brand name for durability and reliability. 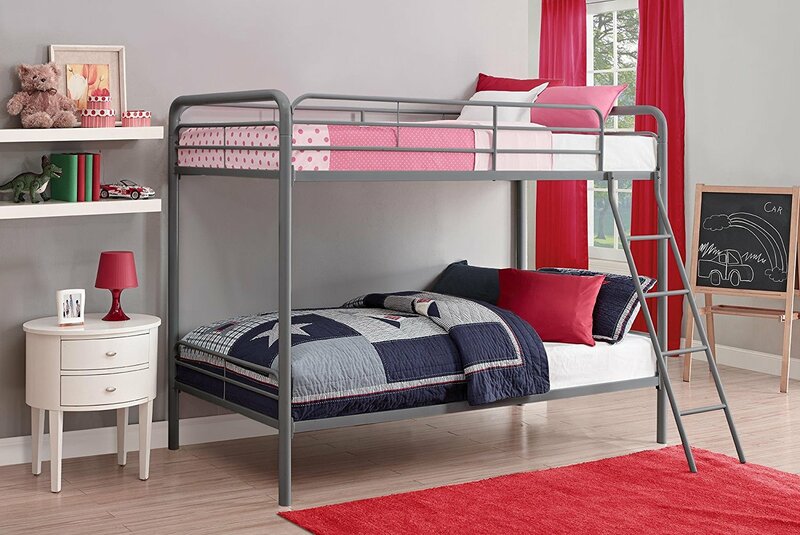 This twin-over-twin bunk bed from DHP comes with very a simple design, super durable metal frame and a slanted ladder. The top deck has guard rails on all four sides for assured safety. The ladder can be screwed to the right side of the top deck. The slanted design is intended to provide maximum safety while reaching the top deck. Keeping in mind the guard rails, the upper deck can accommodate a 6 inch mattress while the lower deck can comfortably fit in an 8 inch mattress. Going with the prescribed weight limits, the upper deck can sustain weights up to 200 lbs and the lower deck supports up to 220 lbs (However, as per user feedback, they can comfortably sustain additional weights but for longevity better stick to prescribed limits). As the entire structure rests on just four legs without any intervening middle legs or additional joints running along the length or width, you can comfortably use the area beneath the lower deck for storage purpose. It is available in 5 different colors and the entire unit ships in one single box and owing to the simple design, the assembly process of this DHP bunk bed is relatively much simpler of all. I somehow believe that investing in a bunk bed is wise decision owing to the return on investment factor. Spending couple of hundred dollars, you can provide your kids with their favorite sleeping options and thereby save considerable space in your sweet home. Assembling the bed along with your kids is fun, a way of showing love and affection towards them and in a way it will surely become a sweet memory for your kids as they grow. Personally I believe that having a full on full bunk bed or full loft bed with under deck area will be most beneficial. If you have two kids go with a full on full and they will last for longer time with sufficient area to roll over. 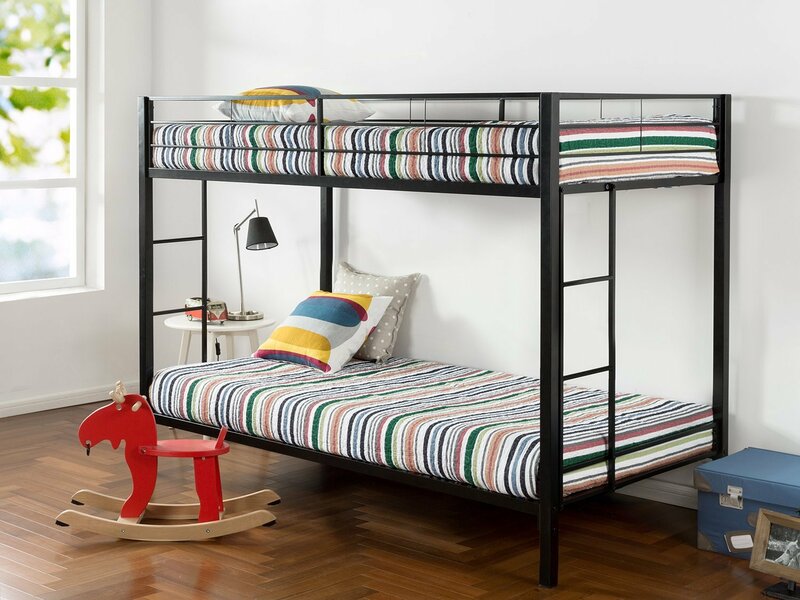 For single kids, perhaps a full loft bed with under deck area either open or with a working table should be perfectly suitable for them to work as well as play.